Straight from the darkest cave of terror, this hanging bat has evil demonic glowing red lighted eyes and poseable wings. 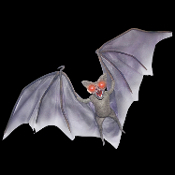 Halloween guests and trick or treaters will run for cover when you hang this larger than life size spooky bat with light up eyes from your ceiling or doorway. Creepy plastic demonic LED eyes glow for an extra scary effect. Posable wings are non-woven cloth fabric over foam and wire, and the body has been covered in velour faux fur. REALISTIC HAUNTED, SCARY, SPOOKY and GROSS... Fresh decor from a creepy haunted house. Light Up Demon Bat with up to 4-foot wide wingspan. Made of cloth covered plastic, polystyrene (dense Styrofoam) and wire.